Fits Narrow I-Beam and Tube Axles; Superbell, Magnum, SO-CAL. Fits all Wide I-Beam and Tube Axles; Superbell, Magnum, SO-CAL. 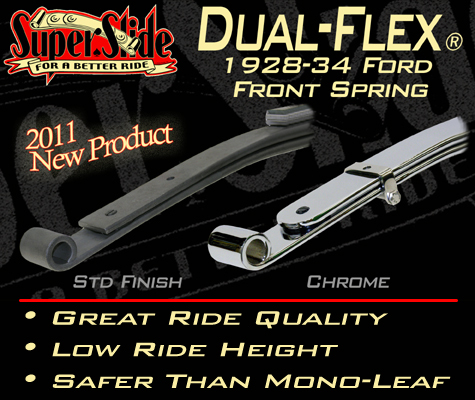 New for 2011, POSIES is proud to introduce Dual-Flex® front springs for 1928-34 Fords. Dual-Flex® springs are a dual tapered leaf spring design that offers the same industry leading ride quality as our SuperSlide® springs, while enabling the car to sit at a lower stance than a multileaf spring. The springs offer a 100% increase in safety over a mono-leaf design and a much better ride as reported by customers who replaced them. Available in 29″ and 31″ lengths to fit most narrow and wide I-Beam or Tube axles. Three spacers supplied to adjust ride height. Delivered in standard steel finish or optional chrome plating. POSIES offers all associated spring products to complete your Hot Rod.